In the present study, Indian mackerel was dried by microwave vacuum drying (MVD) method and compared its physico chemical quality to mackerel dried by hot air drying (HAD) method. Antioxidant effects of thyme oil (TMO) and clove leaf oils (CLO) during storage were also evaluated. Brine salted mackerel was dried in hot air oven (50–55 °C) and microwave vacuum dryer (600 W and 600 Hg mm). For essential oil treatment, mackerel was dipped in 0.75% TMO and CLO for 5 min. Moisture content of MVD and HAD samples was reduced to 30–32% in 1.2 h and 12 h, respectively. Rehydration ability and water absorption index of MVD samples were significantly higher to that of HAD samples. Mackerel dried by HAD showed significantly higher salt soluble and water soluble protein nitrogen fractions than that of MVD samples. Significantly higher hardness and chewiness values were observed for HAD samples. Color and appearance of uncooked MVD sample was superior to that of HAD samples. As per the results of PV and TBARS, TMO exhibited better antioxidant effect compared to CLO. The study demonstrated that fast drying can be achieved by microwave vacuum dryer and it can produce dried fish having better sensory and textural attributes. We thank the technical staff of Visakhapatnam Research Centre of ICAR-CIFT for their assistance during the work. 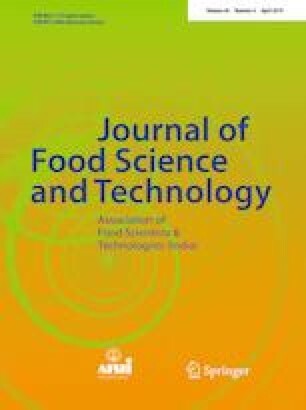 The authors would like to acknowledge the support of Indian Council of Agricultural Research, New Delhi, India.